The smell of burnt asphalt fills the air whenever one is at any Formula One Grand Prix race. But this season, you can smell and look like a Ferrari fan if you buy their fragrance! 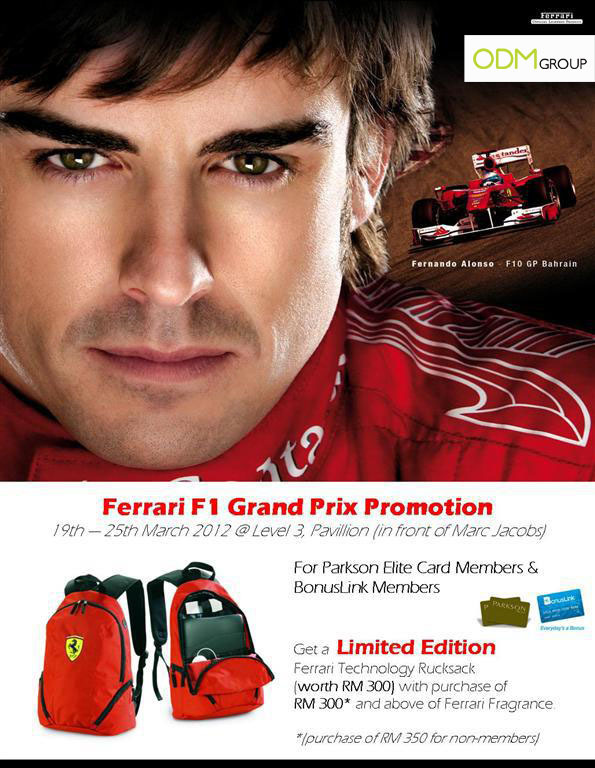 Every purchase of RM300 worth of Ferrari fragrance entitles one to a limited edition Ferrari technological Backpack. This striking red product is customized to fit a laptop, mouse as well as water bottles. Companies can choose to customize their products in anyway they want. An option for a divider or a stationery slot can be easily made. If you are having trouble brainstorming, feel free to approach ODM and we would be more than happy to assist you in the process. This is a great promotional gift for Ferrari fans as their merchandise are collectables. It would also increase brand loyalty and encourage them to continue buying Ferrari products. Furthermore, this promotional product is branded with the Ferrari logo prominently located on the bag. So, why not opt for an interesting way to support your favourite F1 drivers Fernando Alonso and Felipe Massa this F1 season – wear the Ferrari fragrance.